DHANBAD: The 116th birth anniversary of Netaji Subhash Chandra Bose was observed at different places in Dhanbad amid blood donation camp, rallies and lectures on Wednesday. The programme was organized by Citizens Council. Sharad Dudhani, the president of the council, said the Netaji statute on G T Road that was damaged in November last year was redesigned and re-installed at Govindpur. P N Singh, MP from Dhanbad, unveiled the statue at Govindpur. The Bengali Welfare Association organized a procession early in the morning from Durga Mandir at Hirapur and marched through the thoroughfares of the town. The rally ended at the Netaji statue where garlands were offered by president of the association Satinath Ghosh and its general secretary Gopal Bhattacharya. About 2,000 students from Delhi Public School, Koyalanchal Public School, Coalfields Public School and other schools joined the procession. A blood donation camp was organized at Durga Mandir, where leaders of the association participated and donated blood. Deputy mayor Niraj Singh offered prayers at the Netaji's statue at J C Mulick road. Forward Bloc organized a function at Naya Bazar, where speakers recalled the contribution of Netaji in the freedom struggle. A function was held at Gomoh railway station which was renamed Netaji Subhas Chandra Bose station recently. Netaji had boarded the Frontier Mail at Gomoh after reaching there from Howrah by G T Road. As India struggles being neck-deep in the quagmire of corruption and vested interests, a man 's birthday will quietly pass by. Many say he is the forgotten hero, but to some others he is the unspoken hero who has never got his due. 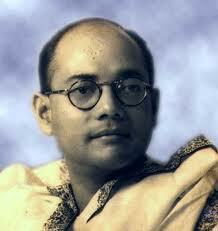 Subhash Chandra Bose or Netaji as he is fondly called, if alive would have turned 114 today on Jan 23. His contribution to the Indian freedom struggle is at par with the Mahatma, but still in the official circles he is never spoken of in the same vein as Mahatma Gandhi, Pandit Nehru or Sardar Vallabhai Patel. The man who quit the prestigious Indian Civil Service, risked his life to flee the nation to raise an armed struggle against the mighty British rulers of India certainly doesn't deserve the snub being meted out. Students of Akshara International School participating in Netaji Subhas Chandra Bose birth anniversary celebrations in Vijayawada on Wednesday. The Students of Akshara International School, Chuttugunta, and Ashok Nagar branches, turned up in the army dress worn by freedom fighter Netaji Subhas Chandra Bose to mark his birth anniversary on their school premises on Wednesday. Children from Classes 1 to 7 participated in the Ashok Nagar School biography, quiz and personality competitions related to Subhas Chandra Bose. Students from Classes 3 to 9 participated enthusiastically in the essay writing and biography competitions. The school principals K. Prasanthi and Kakarla Sarada Anil Kumar participated in the respective schools, encouraging students to understand the sacrifice of the freedom fighter and emulate his ideals. These competitions were basically to make the children of this era know at least something about our freedom fighters, they said. Jamshedpur on Wednesday paid tribute to Netaji Subhas Chandra Bose on his 116th birth anniversary with series of programmes. The Bengal Club in Sakchi took out a rally to mark the occasion. The rally, which began from the club, was attended by members of different social organisations and 150 students of five schools ' Sardamoni High School, Sakchi High School, Vivekananda High School, Ramkrishna Mission Vivekananda Middle School and Ramkrishna Mission Sardamoni Girls High School. The rally culminated with a floral tribute to the leader's statue at Ambagan in Sakchi. Political parties also joined in the celebrations. City unit of JMM and JVM paid floral tributes to Netaji at their respective offices in Sakchi. The leaders including JMM district president Ramesh Hansdah and JVM district president Firoz Khan at separate functions called upon youth cadres to follow Netaji's teachings. Members of the Bistupur based The Milanee used the occasion to inaugurate a bust of Netaji on its campus. More than 50 trainee teachers of Loyola College of Education at Birsanagar took out rally to Pragati Saraswati Mandir School in Birsanagar. City-based NGO Hind Club organised a blood donation camp at New Ranikudar in Kadma to commemorate the birth anniversary where 98 units were collected and handed over to Jamshedpur Blood Bank. Subhas Sanskriti Parishad, a socio-cultural outfit, also paid rich tributes to Netaji at a function organised at the Kamani Centre in Bistupur. Mission Netaji is a Delhi based Indian non-profit trust, conducting research on Indian freedom fighter Netaji Subhas Chandra Bose. Mission Netaji mainly looks into the circumstances of disappearance of Netaji. Mission Netaji runs the websites www.missionnetaji.org and www.subhaschandrabose.org. Mission Netaji is of the view that Indian governments over the years have been trying to smother the truth. According to the Indian government, Netaji Bose died in a plane crash in Taihoku (Now, in Taiwan) on August 18, 1945. His remains are kept at the Renkoji Temple in Japan. But from the documents Mission Netaji could collect, it is clear that Bose had plans to escape to Russia during August 1945 and the plane crash was a cover-up to mislead the British. This possibility was also hinted by Justice MK Mukherjee Commission of Inquiry that probed into this case. Anuj Dhar, one of the founders of Mission Netaji, was instrumental in earning valuable information from the Taiwan government that no plane crash involving Netaji Bose had happened in or around Taihoku airport on or around August 18, 1945. The Mukherjee Commission corroborated this finding. But, the Indian government rejected the findings of the commission. Since then, Mission Netaji has been fighting to bring out the truth, utilising the Right to Information Act. Mission Netaji approached the Central Information Commission of India, under the Right to Information Act, protesting against the Indian government's indifference in this matter. This has been a legal battle, covering almost all clauses in the RTI Act. Mission Netaji calls this fight by the name 'Right To Information Crusade' (RTI Crusade). • To collect and preserve all relevant intelligence, de-classified documents and manuscripts, photographs and films, records and other objects and materials - relating to the mystery surrounding the disappearance of Netaji Subhas Chandra Bose. • To establish a world wide network of committed individuals, groups and organisations, sharing a common vision. • To publish materials dealing with the mystery surrounding the sudden disappearance of Netaji Subhas Chandra Bose. • To provide medical relief to the weaker section of the society. • To take steps to eradicate illiteracy. • To encourage and support the efforts aimed at eradicating discrimination based on caste, religion and gender. • To take appropriate measures for providing aid and assistance to the people affected by natural calamities or devastating accidents. • To organize and conduct such appropriate schemes, activities and ventures for the welfare of the people in general, and for charitable purposes as decided by the members from time to time. Mission Netaji is of the view that Netaji Subhas Chandra Bose escaped to the Soviet Union towards the end of the second world war. But the Indian government has been holding on to its claim that Netaji died in the air plane crash on August 18, 1945. The Justice Mukherjee Commission of Inquiry that probed into this case said in its report that there was no such plane crash and Netaji didn't die on the said date. The Indian government dumped this report, favouring the findings of two former commissions that probed into this case in the second half of the 1900s, headed by Shah Nawaz Khan and then GD Khosla. Due to these discrepancies in the reports, Mission Netaji decided to launch its information seeking campaign entitled 'RTI Crusade'. The organisation utilises the Right To Information Act to seek evidences from various governmental wings, with pleas submitted to the Central Information Commission of India. This has been an enduring fight between the government and Mission Netaji. Mission Netaji seeks information from the Prime Minister's Office (PMO), Ministry of External Affairs (MEA), Ministry of Home Affairs (MHA), and the Research and Analysis Wing (R&AW). Mission Netaji, so far, has been successful in creating importance to this issue, which was long forgotten by the public and the administrators alike. The approach from the part of the government has not been encouraging. This section explains the various documents requested by Mission Netaji along with their statuses. • Information whether the PMO and R&AW, which reports to the Prime Minister, hold several classified records on Subhas Chandra Bose. If yes, a descriptive list of such records/materials thereof. Status: PMO has said that the disclosure would harm India's relations with foreign countries. PMO has also sought dismissal of RTI appeal on the destroyed files regarding Bose. • Release information on Nehru's file enquiring into the death of Subhas Chandra Bose. Status: PMO informed that the file was destroyed as part of a routine housekeeping process. However it was not informed who ordered the destruction of the file and why. • Certified copies of the complete correspondence the MEA has had with the Governments of the USSR and the Russian Federation over the disappearance of Netaji. Status: CIC rejects government's stance on Russia correspondence papers. Commission tells government to take up the matter with Russians if it feared that the disclosure would harm relations between the two nations. Status: MEA informed the Central Information Commission that the Russian government is not in favour of the disclosure of facts. • Authenticated copies of the all documents exhibited before the Shah Nawaz Committee (1956) and GD Khosla Commission (1970–74). Status: CIC demanded MHA to disclose information on Netaji mystery within three months. This order came on July 5, 2007. CIC later scolded Home Ministry for not parting with the information. The full CIC bench heard MHA-Netaji secret papers case. • Release documents related to the death of Netaji Subhas Chandra Bose. Status: Government released 91 documents related to the death of Bose. Records include Intelligence Bureau reports, Ministry of External Affairs' telegrams & prime ministerial correspondence. One note by Prime Minister Jawaharlal Nehru remains classified. • Release the truth regarding M. O. Mathai's note about receiving the remains of Bose in India. Status: After hearing the views of MEA and Mission Netaji, the Central Information Commission(CIC) stated that one can only hope that some serious researcher will look into one of the greatest mysteries of modern India and arrive at a definite conclusion. • Are there any records/materials on and relating to Subhas Chandra Bose in RAW? Status: Cannot intervene in Netaji-R&AW case, says CIC. In January 2009, on the occasion of the 112th birth anniversary of Subhas Bose, Italian ambassador to India, Alessandro Quaroni stated that there was no point in continuing research on whether Bose died in a plane crash or not in August 1945. In a statement issued against this remark, Mission Netaji stated that there was evidence which held that Bose did not die in any plane crash. Mission Netaji cited reference to a note preserved in the Princeton University Library which quotes the former Italian ambassador Pietro Quaroni, father of Alessandro Quaroni, as saying that he did not think the news of Bose's accidental death was true. The note was written by Mohandas Gandhi's biographer and Pulitzer Award winning American journalist Louis Fischer. Pietro Quaroni had helped Bose escape to Moscow in 1941. Fischer had met Pietro Quaroni in Moscow in November 1946 and quoted him saying it was possible "that Bose is still alive". Quaroni had told Fischer that Bose did not want the British to look for him, so the false rumor of his death was circulated. Justice Manoj Kumar Mukherjee who probed into the disappearance of Netaji Subhas Chandra Bose stated in his report that the sanyasi of Faizabad (Bhagwanji) was not Bose as there was no clinching evidence to prove it. However, he inadvertently stated in a documentary shoot that he believed Bhagwanji was none other than Bose. This revelation supports Mission Netaji's stand that Bose had not died in the plane crash in 1945. In light of this revelation, Mission Netaji demanded a thorough enquiry into the mystery. Sugata Bose, grand nephew of Netaji Subhas Bose wrote in his 2011 book His Majesty's Opponent that a part of Netaji's ashes were kept in the house of Rama Murti, the founder of Indian Independence League in Tokyo. He also mentioned that the ashes were brought to India in 2006 under the intimation of the Indian prime minister Manmohan Singh. Mission Netaji sought the validity of this information though the RTI act, and received the information from the Prime Minister's Office that "no such information exists." 13. ^ "RTI makes PMO release info about "Panditji's file" on Netaji". MissionNetaji.org. Retrieved 2012-07-14. 15. ^ "Central Information Commission decision". MissionNetaji.org. Retrieved 2012-07-14. 17. ^ "Govt in a spot over Netaji info - India News". IBNLive. 2007-06-06. Retrieved 2012-07-14. 23. ^ TNN, 24 January 2009, 03:25AM IST (2009-01-24). "No point researching Bose death: Envoy - Kolkata - City - The Times of India". Timesofindia.indiatimes.com. Retrieved 2012-07-14. 24. ^ "The Hindu News Update Service". Hindu.com. Retrieved 2012-07-14. 25. ^ "US record contests Italian envoy's views on Netaji's death - India News - IBNLive". Ibnlive.in.com. 2009-03-19. Retrieved 2012-07-14. A CIC decision has led to partial disclosure by the PMO of papers relating to the destruction of an alleged file on the enquires made by former Prime Minister Jawaharlal Nehru about the whereabouts of Subhas Chandra Bose. The bunch comprises notes from secret files, letter by Prime Minister Indira Gandhi and recent correspondence between Mukherjee Commission and Prime Minister's Office under Atal Bihari Vajpayee. A selection of the papers provided to Mission Netaji can be seen here. File 12(226)/56-PM titled Investigation into the circumstances leading to the death of Subhas Bose was described by Justice Mukherjee Commission of Inquiry (1999-2005) as one which could have been of "great assistance" in resolving the controversy surrounding Bose's disappearance. It was destroyed "during routine process of review/weeding of old records" -- as Kamal Dayani, PMO's Central Public Information Officer, informed Anuj Dhar of Mission Netaji in September last year. Dhar took the matter to Central Information Commission (CIC). Last month, Chief Information Commissioner Wajahat Habibullah directed the Prime Minister's Office to provide certain documents identified by Dhar. The PMO obliged, and so the contours of a shocking tale emerge. In April 1957, more than ten years after the reported death of Subhas Bose, a file was opened in what was then called the Prime Minister's Secretariat. The file was suddenly destroyed in March 1972. Grapevine had it that it was done at the behest of PN Haksar, Prime Minister Indira Gandhi's all-powerful PS. The timing of the destruction clashed with the ongoing judicial inquiry of GD Khosla. Strangely, Khosla, a flamboyant friend of Pt Nehru's, went on to write in his report that the "unwanted" file was "destroyed to lighten the burden of the record rooms". In contrast, Mukherjee, a former Supreme Court judge known for his expertise in criminal law, forced the issue of destroyed Netaji records with the PMO. They were asked to furnish the copies of the order regarding the destruction as well as "authenticated Xerox copies of the Rules and Procedures prescribed for destruction of files". In response, the PMO Director wrote that "no order as such ... could be located" and could only provide "the relevant page of the File Register showing destruction of the file in 1972". The same has been given to Mission Netaji under RTI along with page No 151/C of classified PMO file 2(64)/56-70 PM, Vol-V. The documents give no clue as to who could have ordered the destruction and for what reason. Another PMO letter stated that the Commission may "acquaint themselves with the destruction procedure of files in Govt of India offices" as laid down in Manual of Office Procedure. Mission Netaji traced the Manual of circa 1972 and found that official files in those days were recorded in three categories. "Class A" files or the "records fit for permanent preservation" included "files of historical importance" -- those "relating to a well-known public or international event or cause celebre, or to other events which gave rise to interest or controversy on the national plane". The question of destruction of such files under any "review and weeding of records" did not arise before 25 years and prior consultation with the National Archives of India. File 12(226)/56-PM seemed to have been shredded hurriedly and unlawfully. Why? Mukherjee Commission queried PMO on May 23, 2000 to disclose "the subject and contents of the above file and the circumstances under which the said file had been destroyed". PMO replied that the file "contained agenda paper/cabinet decision" which could be procured for the Cabinet Secretariat as "records of Cabinet proceedings are kept permanently in Cabinet Secretariat". But Commission got nothing from Cabinet Secretariat. Ditto for Mission Netaji, whose RTI request was transferred to the PMO. The released papers further disclose that former Prime Minister Indira Gandhi reasoned in 1974 that the "file was destroyed only because it contained copies". "I can assure you that this file (12(226)/56-PM) contained only copies of certain documents which are still available in other files, she wrote to late MP Samar Guha who had wondered "whether such a vital file has been destroyed or withheld". But, the papers show, this logic too worn thin as the PMO was unable to prove the veracity of former Prime Minister's assertion by providing documents supporting her contention. "The impunity with which such an important file seems to have been destroyed raises a big question mark on the accountability of our political establishment and bureaucracy," remarks Mission Netaji's Chandrachur Ghose. New Delhi: The mysterious disappearance of Netaji Subash Chandra Bose returned to haunt the Union Home Ministry on Tuesday as the Central Information Commission expressed displeasure over its stand of not parting with documents related to his alleged death in a plane crash in 1945. "Who are you to decide if an information can cause unrest? You have to be accountable to the people of the country as to why an information cannot be disclosed. You must change your stated position and take a reasoned decision," Information Commissioner A N Tiwari said during a hearing by a full bench. The full bench, headed by Chief Information Commissioner Wajahat Habibullah, met to decide on a plea by Sayantan Dasgupta, who had sought information from the ministry about documents relied on by two commissions that had arrived at the conclusion that Netaji had died in an air crash in Taiwan. Dasgupta, a member of Delhi-based organisation Mission Netaji, had sought certified copies of all documents exhibited before the Shah Nawaz Khan Committee (1956) and the Khosla Commission (1970-74), which probed Netaji's disappearance, as the recent Mukherjee Commission had contradicted their findings. During the hour-long proceedings, the ministry was at the receiving end as it failed to explain its reasoning that providing the documents could lead to unrest in the country, including in Netaji's home state of West Bengal. "At what level, this decision (for non-disclosure) has been taken? Is it the intelligence, bureaucracy or the politician...?" Tiwari inquired even as the full bench reserved its order on the matter. Kolkata, Feb 4 (PTI) The Taiwan Government has informed the one-man Netaji Commission of Inquiry that there was no air crash at Taihoku on August 18, 1945, till date believed to have killed Netaji Subhas Chandra Bose. Disclosing this to newspersons after a routine hearing of the Commission here, Justice M K Mukherjee said that the Taiwan Government has confirmed to the Commission during its recent visit to that country that no plane crashed at Taihoku between August 14 and September 20, 1945. Justice Mukherjee said that the Taiwanese authorities, who confirmed this fact, promised to provide documentary proof within 15 days. "During the period August 14 to October 25, 1945, no evidence shows that one plane had ever crashed at the old Matsuyama Airport (now Taipei Domestic Airport) carrying Mr Subhas Chandra Bose", Justice Mukherjee said quoting an e-mail sent by Lin Ling-San, Minister of Transportation and Communication, Taiwan government, to Anuj Dhar, a journalist. The commission, which was provided two e-mails reportedly sent by Taiwanese authorities to Dhar, said "the Mayor of Taipei and the External Affairs Ministry of Taiwan government confirmed us the e-mails to be genuine". According to one e-mail, there was no air crash during that period while the other made a reference to a crash on September 20-23, 1945, involving a USC-47 Transporter plane carrying 26 people, most of them believed to be former American POWs just released from camps in the Philippines. That plane, the e-mail said, crashed on Mount Trident in Taitung area, about 200 nautical miles away from Taipei. Justice Mukherjee said the Commission had asked Taiwan government to send some documents from the National Archives of Taiwan as also government records. "We sought some documents, including the daily newspaper reports published in and from Taipei during August 18-24, 1945, containing any reference to Bose," he said. The Commission has also sought documents related to cremation of dead people during that period at the old crematorium in Taipei and some records from the national archives for the years 1943-45, 1956, 1967 and 1973. "They (Taiwan government) have asked for 15 days to despatch those records to us", he added. Meanwhile, the Commission has examined a witness in Bangkok during its visit to Thailand. The witness, Shk Husamuddin B Kapasi, ex-President of Indo-Thai Chamber of Commerce, informed the Commission that he had learnt from his father, a member of the Indian National Army and close associate of Netaji, that Bose had died in the crash. The Commission, which would hold its hearing thrice a week during February for cross-examining witnesses, would wrap up its findings and finalise the report by May 15, 2005, as asked by the Centre, Justice Mukherjee said. "We are not going to seek any extension. We will finalise our report by May 14", he added. Justice Mukherjee, who heard the submissions of Dr Purabi Roy on the reported stay and death of Netaji in Russia after August 18, 1945, said he could not take those as evidence without cross-examination. "We cannot take the submissions as evidences without cross-examination, which will require a visit to Russia", he said, adding that a visit to that country was "very unlikely" given the deadline for the report. Dr Roy, a researcher of the Asiatic Society and a visiting lecturer at St Petersburg University, submitted 53 documents before the commission. While refusing to comment if the commission's inquiry would be incomplete without a visit to Russia, Justice Mukherjee said "given a chance, we will go there as it will help the inquiry. The previous commissions also had not visited Russia as the claims were not put before them". Valour! INA! Indian National Congress! A mysterious plane crash! Mystery! What else synonyms with his name? A 116th birthday wish goes to India’s mysterious hero. Subhash Chandra Bose. It's amazing how Netaji Subhash Chandra Bose continues to be in news 68 years after his disputed death. A BBC online poll had put named Bose the third greatest-ever leader in South Asia after Jinnah and Gandhi. Strikingly, as per the same poll, the stalwarts like Jawaharlal Nehru, Indira Gandhi and the inimitable Atal Bihari Vajpayee don't even blip on the radar anymore. The coming months will see Subhash making a comeback of a sort. India's longest running political controversy is heading towards its grand finale. For five years the media and the law-makers in India have adopted a touch and go sort of approach towards the inquiry of Justice MK Mukherjee into the death of Subhash Bose. Not any longer. The Government will have to present it in Parliament along with an action taken report. All those of you who have interest in either politics, or history, or intrigue, or mystery better watch out, as it doesn't get any bigger than this. Let this impression be trashed at the outset that the Netaji mystery belongs to a different era. No doubt it started in 1945, but it has been simmering till date. The controversy is a bombshell and that's what the official records hint at. Netaji is supposed to have died at the end of Second World War, and yet the Indian Government continues to sit on files about him. And they are wary of approaching the British and Russian Governments to release the papers they are keeping to themselves. But why so much of precaution over some details about a man who ceased to be a problem to his adversaries in and outside India decades back? This is for you Gen-X dudes. Some of the classified Netaji files maintained by the Government of India are of mid-1990s vintage! That is post-Rajiv Gandhi period. Perish the idea. "Oh, such an old story, what is the fuss now!" The Government of India wouldn't agree. They think there is something about Netaji that can spell big time trouble even now. That's why they refused to hand over several Top Secret files to the Mukherjee Commission. Why would they be doing so? Well, in the case of two Narasimha Rao period files, they reasoned that the "disclosure of the nature and contents of these documents would hurt the sentiments of the people at large and may evoke wide-spread reactions. Diplomatic relations with friendly countries may also be adversely affected if the said documents are disclosed." Should not we demand to know what these documents have to say? How on earth can some bits about a dead man affect India's relations with other countries? Should not we ask our Government to state facts? Don't we have a right to know what happened to the man who liberated us? It's cynicism exemplified when people say, "How long can we go on inquiring?" If Americans, for instance, were to be besotted with same defeatist thinking, they would not have become the great power they are today. Indeed they don't give up. How can one leave out in cold those who fought for one's country? Only last year the US Government asked the Indian Government to help them trace out their missing WWII airmen. Netaji went missing while waging war for freedom for us and we don't want to know what happened to him! What is it if not brazen ungratefulness? Some people dismissively say that there have been commissions after commissions that have no idea what sort of frauds were played on the nation by the previous commissions. In 1956, Shah Nawaz Khan, a Congress MP and a secretary to then Railway Minister, headed a committee that turned out to be a puppet on a string, actually. Reasons are there to believe that he did what he was told by the Nehru government. Shah Nawaz was made a minister after this command performance. GD Khosla, who headed a commission in early 1970s, was a friend of Nehru's to start with. He wrote the biography of Prime Minister Indira Gandhi even as he inquired into Netaji's disappearance. Can you imagine such things happening now? Both these panels declared that Netaji had died in a plane crash in Taiwan. Never mind that they did not bother to know what the Taiwan Government thought, much as people wanted them to. "But the issue is dead!" Ok, for argument's sake, if that be the case, it is going to come alive. A Commission of Inquiry headed by a former judge of the Supreme Court of India is going to hand over a report to Home Minister Shivraj Patil, who, at the moment, doesn't seem to be at ease with the direction the Commission is heading to. The report will have to be discussed by the Union Cabinet before being presented in Parliament for a free for all debate. It is inevitable that Netaji mystery will become a hot topic. Shall we thank God for the Mukherjee Commission of 1999! Or shall we thank Mikhail Gorbachev? The fall of the USSR brought the Netaji issue out. In mid-1990s the Russians themselves began saying that Subhash was with them after his death. The matter reached India and the press did rake it up. But Narasimha Rao, with Pranab Mukherjee in tow, would not say a thing. A patriotic fellow moved to Calcutta High Court and the court found the matter to be wide open for inquiry. The Government was chided and told to form a Commission of Inquiry to find out where and how Netaji had died. Mercifully, at the time the verdict came, the NDA was in power. The inquiry of the Mukherjee Commission through the last one decade has been truly and undoubtedly path-breaking. They have found out, among other things that the Government of India, at the PMO level, indulged in systematic, unlawful destruction of evidence concerning the Netaji death case. The Government did not want any inquiry in Taiwan, which is precisely what Justice Mukherjee did. The result is the ROC Government ruled out the very occurrence of the crash we had been told over the decades had killed Netaji. 33 files have been lying on the dusty ignored shelves of the PMO, and more countless ones on the records of the Research and Analysis Wing (RAW). Bose isn’t definitely a forgotten hero, but why is it that we couldn’t still be sure of what the cause of his death was! Always game for populist gestures, this one has got West Bengal chief minister Mamata Banerji into immediate trouble. On Wednesday, she said her government wants to build a memorial to the memory of India’s independence war hero ‘Netaji’ Subhas Chandra Bose on the southern outskirts of Kolkata. The announcement was timed with Netaji’s birthday anniversary on 23rd January. Mamata Banerji said she wants to build the memorial before the hero’s birth anniversary next year at Subhasgram, south of Kolkata, where the Bose family owned a plot of land. "There is nothing except the Netaji Bhavan in Kolkata , so I looked at this spot on Monday and decided to build a memorial in honour of Netaji,” Mamata said. They said there is no clarity on the death of Subhas Chandra Bose and therefore building a memorial will only reinforce the unsubstantiated version of his dying in a plane crash in Taipeh in 1945. “We would much rather expect Mamata to lend her weight to our demand that the Indian government opens all secret files related to Netaji. That will reveal much and set the records straight on many issues including Netaji’s mysterious disappreance,” said Bose’s grand-nephew Chandra Kumar Bose. Bose’s niece Chitra Ghosh echoed similar sentiments. “We don’t want a memorial until we are clear about his last days. Mamata should push the Indian government to reveal all secret files on Subhas Bose and bring to light the truth about his last days. Or else this controversy will never die,” she said. Forward Bloc senior leader Ashok Kumar Ghosh was quick to join the attack. “When West Bengal chief minister Bidhan Roy tried to raise a memorial to Netaji in the 1960s, we protested. We will do that again. It is important to be clear what happened to Netaji before we start building memorials in his honour. We don’t like these cheap gimmicks,” Ghosh said. After Bidhan Roy, it was Pranab Mukherji, now India’s president, who had to duck for cover when in 1996 he said Netaji might have died. The remark provoked public outrage in West Bengal, not because anyone believes Netaji would be alive so late in life but because there is anger that the Indian government was never transparent in investigating his last days. Very few buy the Taipeh plane crash story after a host of authors like Purabi Roy and Anuj Dhar have revealed credible information that Netaji had escaped to the Soviet Union with Japanese help in the last days of the Second World War. Dhar’s book 'India’s Biggest Cover-Up' has been very critical of the Congress governments for keeping Netaji’s last days under the wraps. Netaji Subhas Chandra Bose, born on 23rd January 1897, was twice elected president of the Congress before he left the party in frustration and formed the left wing Forward Bloc. He later escaped from India to Germany and then reached Japan to raise the Indian National Army to fight the British. Indian School children dressed as Netaji, take part in a parade on Netaji Subhas Chandra Bose's 116th birth anniversary in Agartala. CUTTACK: The long awaited Light and Sound show was launched at Netaji Birthplace ... Ndmc pays glowing tributes to netaji ... [Source: www.bbc.co.uk]. More. Historian Sunil Khilnani questions the many myths and stories that surround India's Subhas Chandra Bose. Millions call him Netaji, meaning 'great leader', but his death in August 1945 is still surrounded by controversy and rumour. Bose was a martial hero who broke with Gandhi, conversed with Hitler, raised two armies to fight the British Empire and yet still seems to embody the hopes and fears of many Indians today. he intriguing death of an Indian holy man in 1985 suggested that he was none other than Subhas Chandra Bose, the revolutionary and nationalist who, it is officially claimed, died in an air crash in 1945. The truth, however, is harder to find, as Hugh Purcell discovers. This was the latest but by no means the last of the dramas attending the fate of Bose. During the previous 40 years the Indian government had been forced to set up two inquiries into his death (the Nawaz Khan Committee in 1956 and the G.D. Khosla Commission 1970-74) and, although both confirmed the reported story that he died in an air crash, the rumours persisted. In 1999, reluctantly, but under pressure from Bose’s home state of Bengal in particular, the Indian government appointed Justice M.K. Mukherjee to ‘launch a vigorous inquiry ... to end the controversy ... over the reported death of [Bose] in 1945’. The Formosan clerks ... said the Japanese officer accompanying the dead body, under whose instruction they acted, told them that for state reasons, the particulars of the person had to be kept confidential. Hugh Purcell is a writer on British India. His latest book is The Maharaja of Bikaner in the Makers of the Modern World series (Haus Histories, 2010). On April 3, 1941, a man claiming to be an Italian diplomat arrived in Berlin, demanding to meet with Ernst Woermann, Germany’s undersecretary of state. Woermann listened carefully to the man’s plans, which sought to create a government in exile and launch a military strike against a shared enemy. The government the diplomat planned would be Indian, and the target would be British India. “Orlando Mazzotta” was in fact Subhas Chandra Bose, an Indian leftist radical nationalist and former president of the Indian National Congress. Just a few months earlier Bose had escaped from Calcutta with the help of German and Italian officials. One of India’s national icons, practically on par with Gandhi, Bose eventually became a hero of the anticolonial resistance, establishing the Indian National Army and recruiting thousands to fight imperial power. Despite the strategic benefits of partnering with Bose, the Nazis did not know what to do with him, and the rebel’s irrepressible radicalism only further complicated their overlapping aims. Very little has been published on Bose’s activities in Nazi Germany and his overtures to fascist regimes. Romain Hayes is the first to focus exclusively on Bose’s interactions with Nazi Germany during the Second World War, making extensive use of German, Indian, and British sources, including memoranda, notes, minutes, reports, telegrams, letters, and broadcasts. He also draws on rare materials from recently released German archives. Hayes ultimately reveals lesser known aspects of Nazi foreign policy and challenges Ghandi-centric portrayals of the Indian independence movement. Romain Hayes is a freelance writer. This is his first book. New Delhi: Hundreds of declassified documents related to the death of netaji Subhash Chandra Bose are laying in the Prime Minister’s Office (PMO) and various spy agencies in India, allegdes the family of Netaji and researchers. The family is demanding to make these documents- laying in the shelves of government offices- to be made available to public, so that everyone can come to know the real reason behind the death of Netaji Subhash Chandra Bose. Researcher and author, Anuj Dhar said that there could be over 100s of document laying with the government, which could shed some light on the reason behind the death of the revolutionary. He said that over 33 files are laying with the PMO, where as the Research and Analysis Wing (RAW) has unknown number of documents containing facts about the death. He countered that if government believes that Netaji died in 1945, why is the government not revealing these documents. The Mukherjee commission set up to investigate the death of Netaji denied that the ashes kept in the Japanese temple are that of Netaji. Meanwhile, the only daughter of Netaji, Anita Pfaff believes that Netaji was not granted the right place in history. She said that many people were jealous of Netaji. She felt that Netaji was sidelined and 'personal jealousy' could be a major reason this. Netaji Subhash Chandra Bose was born on January 1897 in Cuttack, Orissa. He was one of the most prominent Indian nationalist leaders who attempted to gain India's independence from British rule by force during the waning years of World War II with the help of the Axis powers. It was reported that Bose died soon thereafter from third degree burns received after attempting to escape in an overloaded Japanese plane which crashed in Taiwan. On the occasion of his 116th birth anniversary, the entire nation is paying its tribute to one of the greatest leaders in modern India. The long awaited Light and Sound show was launched at Netaji Birthplace Museum at Odia Bazaar here as a tribute to Subash Chandra Bose on his 116th birth anniversary on Wednesday. Besides inaugurating the light and sound show, Odisha chief minister Naveen Patnaik also opened a new gallery of the museum which is dedicated to the spiritual life of the freedom fighter. The hour-long light and sound show depicting childhood days of Netaji in Cuttack would be a regular feature of the museum in the evening, a museum official said. After a public sector company had backed out from the Rs50 lakh light and sound project midway, the state government sanctioned Rs30 lakh in 2011 to complete it. The new gallery opened by the chief minister at the Netaji museum showcases the spiritual aspect of Netaji. "The spiritual beliefs of Netaji are not well known among the people. The new gallery will showcase that aspect," the official said, adding Netaji always carried a copy of the Gita, a photo of Goddess Kali and rudrakhya beads with him. Artifacts collected from several sources related to Netaji's spiritual beliefs find place in the new gallery. The museum earlier had 15 galleries displaying books, periodicals, rare photographs, artifacts, household articles of Netaji relating to his childhood and INA days. People in large numbers also participated in the special puja and yangnya held here at the museum which was known as 'Janakinath Bhawan', named after Netaji's father. Over 10,000 people visited the museum on Wednesday to pay homage to the great freedom fighter, who was born here on this day in 1897, the official said. MADURAI: The 116th birth anniversary of Netaji Subash Chandra Bose was celebrated in a quiet manner here on Wednesday, but what many are not aware of is Netaji's lesser-known visit to Madurai in 1939. Interestingly, Madurai was the only place in Tamil Nadu visited by Netaji, apart from Chennai. It was on September 6, 1939, that Netaji reached Madurai thorough a train, which offered a once in a lifetime opportunity for thousands in the temple city to have a glimpse of him, says 97-year-old I Mayandi Bharathi, freedom fighter and writer. Flipping though a scrapbook containing photos and information - which he plans to compile as a book -Bharathi proudly boasts about his lifetime opportunity to welcome Netaji in Chennai on his way to Madurai. Bharathi was the then president of Chennai Province Extreme Youth Wing. Talking about Netaji's Madurai visit, V Swaminathan, Madurai-based Netaji National Association said he collected some information from Parasuram, who died three years ago at the age of 77. Parasuram was 14 years old when Netaji visited here and had said that he was attracted to the towering leader from the first glimpse. "Netaji's visit to Madurai was amidst high drama, as he decided to come only at the last minute at the behest of U Muthuramalinga Thevar, who compelled him to visit the temple city," says Swaminathan. When Netaji was addressing the public in Chennai on September 3, 1939, he received information that the World War II broke out. He was called for a high-level meeting convened by Mahatma Gandhi to discuss the situation then. Netaji had to cancel his plan to tour across Tamil Nadu when he was on a six-month campaign across the nation. "However, he agreed to visit Madurai. He reached the temple city in the morning and met many important personalities here including Karumuttu Thiagaraja Chettiar. Since the visit was unplanned, no public meeting was held," Swaminathan said. While the whole nation was waiting for the reaction of Netaji on the WW II, he remained composed. An incident which took place during his visit was quite evident to prove his composure. Parasuram, who was 14 then, followed Netaji wherever he went requesting for an autograph. Since Parasuram could not go near Netaji, he conveyed to him from a distance, through sign language that he lost his autograph given earlier. Surprisingly, Netaji too replied to Parasuram with the sign language that he would give two more autographs. Netaji called him later and handed over a bouquet, which was presented to him. Parasuram had a chance to share space with Netaji and Muthuramalinga Thevar, said Swaminathan recollecting Parasuram's narration. Bharathi said that Bose loved Tamils a lot. "Netaji once said that if he were born again, he loved to be born as a Tamilian. He said this after he was overwhelmed by support of Tamils in establishing the Indian National Army in Burma ( Myanmar) and Malaysia," Bharathi said. n fact I do. You need to read his speeches and writings. In fact more is available about him in Bengali language. He had said he would have sought 25 years of absolute power. And the people would have happily given him. A charismatic and magnetic personality, people were ready for any sacrifices asked by him. In INA people did give their life for him. Perhaps the only leader, beside Jinnah, who had integrity. His patriotism, enthusiasm for work and leadership qualities remain unmatched. The fourth Netaji Subhas State Games was inaugurated on the birthday of Netaji Subhas Chandra Bose at the Netaji Indoor Stadium amid expectation of reviving many dormant sports associations. State sports minister, Madan Mitra, declared the Games open and promised to prop up the efforts of the Bengal Olympic Association (BOA) with financial support. “We want medals from international events like the Olympics and Asian Games. I urge the BOA to move in that direction,” he said. The Games were held in 1999, 2009 and 2011. Competition will be held in 41 disciplines at the SAI, Netaji Subhas Eastern Centre, Khudiram Indoor Hall and Bowbazar Bayam Samity, among other venues. Subhas Chandra Bose was born in a Bengali Hindu, Kayastha, family on January 23 in 1897 in Cuttack, Orissa, then a part of Bengal Presidency, to Janakinath Bose, an advocate, and Prabhabati Devi. His parents' ancestral house was at Kodalia village (near Baruipur; now known as Shubhashgram, South 24 Parganas, West Bengal). He was the ninth child of a total of fourteen siblings. He studied at Stewart School, Cuttack, an Anglo school, until the seventh standard and then shifted to Ravenshaw Collegiate School. After securing the second position in the Matriculation examination of Calcutta province in 1911, he got admitted to the Presidency College, where he studied briefly. His nationalistic temperament came to light when he was expelled for assaulting Professor Oaten for the latter's anti-India comments. He later joined Scottish Church College under University of Calcutta and passed his B.A. in 1918 in Philosophy. Subhas Chandra Bose left India in 1919 for Great Britain with a promise to his father that he would appear in the Indian Civil Services examination (ICS). He went to study at Fitzwilliam College, Cambridge, and matriculated on 19 November, 1919. He came out fourth in the ICS examination and was selected, but did not want to work under an alien government which would mean serving the British. He resigned from the Civil Service job and returned to India. Back in India, Subash started the newspaper Swaraj and took the charge of publicity for the Bengal Provincial Congress Committee. His mentor was Chittaranjan Das, who was a spokesman for aggressive nationalism in Bengal. In the year 1923, Bose was elected the president of All India Youth Congress and also the Secretary of Bengal State Congress. He was also the editor of the newspaper Forward, founded by Chittaranjan Das. Bose worked as the CEO of the Calcutta Municipal Corporation for Das, when the latter was elected mayor of Calcutta in 1924. In a roundup of nationalists in 1925, Bose was arrested and sent to prison in Mandalay, where he contracted tuberculosis. Bose advocated totally unconditional independence for India, whereas the All-India Congress Committee wanted it in phases, through Dominion status. Finally, at the historic Lahore Congress convention, the Congress adopted Purna Swaraj (complete independence) as its motto. Gandhi was given rousing receptions wherever he went after Gandhi-Irwin Pact. Subhas Chandra Bose, reminiscing about the travels with Gandhi, later wrote that the great enthusiasm he saw among the people inspired him tremendously and that he doubted if any other leader anywhere in the world had experienced such a reception as Gandhi did during these travels across the country. Subash was imprisoned and expelled from India. Defying the ban, he came back to India and was imprisoned again. Bose was elected president of the Indian National Congress for two consecutive terms, but had to resign from the post following ideological conflicts with Mohandas K. Gandhi and after openly attacking the Congress' foreign and internal policies. Bose believed that Gandhi's tactics of non-violence would never be sufficient to secure India's independence, and advocated violent resistance. He established a separate political party, the All-India Forward Bloc and continued to call for the full and immediate independence of India from British rule. He was imprisoned by the British authorities eleven times. His famous motto was: "Give me blood and I will give you freedom". Subhas Bose's stance did not change with the outbreak of the Second World War, which he saw as an opportunity to take advantage of the British weaknesses. At the outset of the War, he left India, travelled to the Soviet Union, Nazi Germany and imperial Japan, seeking an alliance with each of them to attack the British government in India. With imperial Japanese assistance, he re-organised and later led the Azad Hind Fauj or Indian National Army (INA), formed with Indian prisoners-of-war and plantation workers from British Malaya, Singapore, and other parts of Southeast Asia, against the British forces. With Japanese monetary, political, diplomatic and military assistance, he formed the Azad Hind government-in-exile, and regrouped and led the Indian National Army in failed military campaigns against the allies at Imphal and in Burma. Subhas Bose's political views and the alliances he made with the Nazi and other militarist regimes at war with Britain have been the cause of arguments among historians and politicians, with some accusing him of fascist sympathies, and others in India being sympathetic towards the realpolitik that guided his social and political choices. It is also believed by a section of people in India that if Subhas Chandra Bose could win the freedom of India all by himself, the face of today's Indian sub-continent would have been different. Subhas Bose believed that the Bhagavad Gita was a great source of inspiration for the struggle against the British. Swami Vivekananda's teachings on universalism, his nationalist thoughts and his emphasis on social service and reform had all inspired Subhas Chandra Bose from his very young days. The fresh interpretation of India's ancient scriptures had appealed immensely to him. Many scholars believe that the Hindu spirituality formed the essential part of his political and social thought throughout his adult life, although there was no sense of bigotry or orthodoxy in it. Subhas Bose, who called himself a socialist, believed that socialism in India owed its origins to Swami Vivekananda. As historian Leonard Gordon explains, "Inner religious explorations continued to be a part of his adult life. This set him apart from the slowly growing number of atheistic socialists and communists who dotted the Indian landscape." Bose's correspondence (prior to 1939) reflects his sharp disapproval of the racist practices, and annulment of democratic institutions in Nazi Germany. However, he expressed admiration for the authoritarian methods (though not the racial ideologies), which he saw in Italy and Germany during the 1930s, and thought they could be used in building an independent India. However, Bose had clearly expressed his belief that democracy was the best option for India. The pro-Bose thinkers believe that his authoritarian control of the Azad Hind was based on political pragmatism and a post-colonial recovery doctrine rather than any anti-democratic belief. During the World War, however, (and possibly beginning from as early as the 1930s) Bose seems to have decided that no democratic system could be adequate to overcome India's poverty and social inequalities, and he wrote that a socialist state similar to that of Soviet Russia (which he had also seen and admired) would be needed for the process of national re-building. Accordingly, some suggest that Bose's alliance with the Axis bloc during the War was based on more than just pragmatism, and that Bose was a militant nationalist, though not a Nazi nor a Fascist — for he supported empowerment of women, secularism and other liberal ideas. Alternatively, others consider that he might have been using populist methods of mobilisation common to many post-colonial leaders. Bose never liked the Nazis, but when he failed to contact the Russians for help in Afghanistan, he approached the Germans and the Italians for help. His comment was that if he had to shake hands with the devil for India's independence he would do that. Bose is alleged to have died in a plane crash at Taihoku (Taipei), Taiwan, on August 18, 1945, while en route to Tokyo and, possibly, then to the Soviet Union. The imperial Japanese Army Air Force Mitsubishi Ki-21 bomber he was travelling on had developed engine trouble, and when it crashed Bose was badly burned, dying in a local hospital four hours later. His body was then cremated, and a Buddhist memorial service was held at Nishi Honganji Temple in Taihoku. His ashes were taken to Japan and interred at the Renkoji Temple in Tokyo. This version of events is supported by the testimonies of one Captain Yoshida Taneyoshi, and a British spy known as "Agent 1189." Shillong, Jan 23: Braving the morning biting cold, large number of people today paid homage to freedom fighter Netaji Subhash Chandra Bose on the his 116th Birthday Anniversary held in Shillong. People from the different localities carrying the National Tri Colour flags and posters of Chandra Bose converged at the premises of The State Central Library to pay floral tribute to the great leader of India. Amidst the chanting of some of the great slogans coined by the revolutionary freedom fighter Subhas Chandra Bose, people from the different localities carrying the National Tri Colour flags and posters of Chandra Bose converged at the premises of the State Central Library to pay floral tribute to India’s freedom fighter Subhas Chandra Bose who was an outstanding leader of the freedom movement and a revolutionary par excellence who took the struggle for independence beyond the Indian borders. .
Children, men, women came walking to State Central Library, Besides the general public, army, police and Government officials also took part at the 116th irthday Celebration of Netaji Subhash Chandra Bose organized by Greater Shillong Netaji Subhash Chandra Bose Birthday Celebration Committee. This autobiography evokes the socio-cultural environment in which Subhas Chandra Bose grew up and the lineaments of his intellectual development. ‘Give me blood, and I will give you freedom’. I do not need to mention who mouthed these illustrious lines, as you, dear reader, know all too well . Amidst all the hues and cries, amidst all the fairy tale- ish ‘did you know’ facts and figures, the line quoted above had a particularly deep impact on my psyche. A certain individual, who goes by the name of Subhas Chandra Bose and has been affectionately christened ‘Netaji’ by his vast legion of supporters has urged his countrymen to uninhibitedly take the ‘big plunge’. As I grew up, I tried to decipher more profoundly what he actually meant when he said actually mouthed this line: lives are to be sacrificed, blood stained carcasses are to laid out and ‘legends’ are to be carved out if freedom has to be ‘earned’. Generations came and went away, yearning for fundamental, political, religious, social and moral freedom, but an extraneous power rigidly maintained its vice- like grip on our land and our psyches. Blood- strewn lanes and by lanes made for eyesores, yet became the norm, as we as an entity ceased to have a collective identity. The Indian conscience was scarred, the hurt reflected on the faces and the chagrin was seething within. Yes, there were individuals who gave us ‘hope’, chartering along the path of ‘No Violence Please’, but then, the chagrin within needed a ‘vent’. It was this individual we know by the name of Subhas Chandra Bose, who gave our country that much- needed vent. I realized, that the quote which had a deep impact on my seven- year old psyche, actually had a much more pronounced impact on the psyche on a nation cicatrized and scarred beyond recognition. A nation that was scrounging to break across the imposed shackles and thump its superiority, was going nowhere with its laughable ‘anonymity’. The zeal was there, but the zeal was misplaced. It needed fervour, it needed furore, it needed passion, and it most definitely, needed ‘blood’. Netaji had stated the ‘obvious’. Fervour, furore, passion and the insatiable urge for freedom, Netaji encapsulated them all. His brand of ‘passion’ is yet to draw a respectable parallel: the passion that had ignited the psyche of an entire nation. Netaji embodied everything that Mahatma Gandhi did not (and vice- versa), as both as political personalities were diametrically opposite, though their basic fulcrum hinged on a common cause: freedom from British rule. His patriotism first came forth when as a student of the Presidency College in Calcutta, he assaulted Professor Oaten for his anti- India snide remarks, for which he was eventually expelled. He went to the Cambridge University later and ranked 4th in the prestigious ICS examination, but did not go for further honours as that would have meant serving an alien government. After returning to India, he started the ‘inflammatory’ newspaper ‘Swaraj’, and in alliance with his mentor Chittaranjan Das, he unabashedly advocated aggressive nationalism. Netaji was then thrust into the role of the president of the All India Youth Congress and the Secretary of the Bengal State Congress simultaneously, roles he relished no end, as they gave him the requisite platform to propagate his agenda. He however, was arrested soon after. After being released from prison, he found good sense (and with good reason) in joining the National Congress and form alliances with Jawahar Lal Nehru and Mahatma Gandhi, but was later arrested again for civil disobedience. After travelling across Europe in the mid- 1930s to study the facets of revolutionism, communism and fascism (with a brief meeting with renowned leader Mussolini), Netaji returned to India as a leader of national repute and a thoroughbred candidate for the all- important powers at the Indian National Congress. Yes, he professed arson, he professed the use of armoury and the need for ‘Armageddon’, which directly conflicted the Gandhi ‘school of thought’. And then, he parted ways with the Congress. Subhas Chandra Bose was now an equi-potent entity in his own right. Then began a spine- chilling chapter of patriotism, sacrifice, ingenuity and dexterity, that culminated in heart- wrenching treachery.Read: Netaji’s mysterious death. Be it the formation of the All India Forward Bloc when he believed in striking when the iron is hot i.e., attack the British when most of its resources were engaged in the 2nd World War rather than wait for them to grant independence, his espionage from his Kolkata residence to Germany while masquerading as an Afghan under strict British surveillance, or his alliances with the greatest dictator history ever knew of, Adolf Hitler, each of these episodes evoke awe and intrigue. It isn’t humanly possible to pen down the back- breaking obstacles he faced while actualizing what he envisioned, as they would risibly pale in comparison to the efforts he had put in. His political wisdom exceeded mediocrity now, as he now wished to emulate the European political success stories and implement the same in strife- torn India. When his German mission crash-landed due to Hitler’s flummoxing tactics, his Japan espionage via a submarine was another sinister story. One can’t possibly discern in this day and age the travails he encountered while giving flesh and blood to the Azad Hind Fauj, nor can one fathom the countless conundrums Netaji was up against whilst spearheading the Indian National Army. The INA blossomed and floundered under his stewardship, but he as a leader of men stood head and shoulders above every other mortal. Each of the countless episodes across the globe had a heart- wrenching story to tell, each vividly embellished the fact that Netaji loved his motherland so intensely that mankind ceased to have men like him anymore. I wish I could have mentioned them all here. The fact that he is a much- revered figure in nations like Japan, Germany, Myanmar and Malaysia till date speak volumes about his unquestionable presence amongst the pantheon of absolute legends. He is amongst the last of the ‘Mohicans’, somebody who dared to wear his heart on his sleeve, somebody who love for his motherland made him transcend conventional limits of sanity and parity. What happened to him post 1945, is something that is still to be unveiled. A lot of facts are assumed to have been swept under the carpet, a zillion unraveled truths have been ‘hush- hushed’, and discussing that now might open a huge can of worms. Let’s steer clear of that now. Netaji’s sacrifice has since been relegated to the odd history book or the odd ‘commemorative speech’ at an election rally. Let’s not remorse about that, let’s gamely accept the fact that he didn’t get the respect or recognition he richly deserved. How can he possibly, he didn’t exactly have a Gandhi surname, did he? Nor is he seen more than a temporary ‘passive’ member of the Congress back then. Unfortunately, some ‘privileges’ are meant for certain ‘classes’ only. A ‘Congress’ tag can do wonders (even if you don’t exactly deserve it). So back we are again to what we are best at! Pay effusive tributes to a yesteryear hero on his birthday and then give a damn about him for the rest of the calendar year. It’s almost as if we are genetically programmed to pom- pom about a hero on his birthday or the day he embraced martyrdom, his ‘unforgettable’ sacrifices, his ‘oh- so- legendary’ tales that have become an indelible part of our folklore. And then, as the clock strikes 12 am, the ‘acts’ and the ‘role- plays’ fizz out faster than you can exhale the air in your lungs. Netaji Subhas, who?? Don’t be at all surprised if you get to hear this more often from now. The dust will settle on his forlorn soul, his mystery would remain unsolved, his legend would still be deprived of aristocracy. Our much- vaunted names seated on the most prestigious seats have done preciously little preserve the legacy of one of the most enigmatic leaders the world ever witnessed. Would soul- redemption do any good? Netaji, the man, the leader, can do well sans that, gentlemen. We certainly aren’t keeping our fingers crossed.